In the scheme of things, my knowledge and experience is essentially zero. 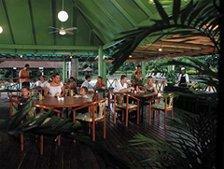 I am having a slow breakfast at the hotel which has been my second home this year in Port Moresby (POM). I look around the tables at the familiar mix of people; ex-pats, some who seem to literally live here, others here for a few days, local professionals including a colleague from PNGSDP, landowners who cut their own path through the a western style hotel …. Just one experience can change everything. I was talking yesterday with a permanent expat resident, and he was relaying the story of how some people downplay the security risk. He commented how that all changes when they experience violence. Our view of the world (every event, relationship, thing, place, philosophy, ….) is totally shaped by what we understand based on our experiences. This is both legitimate and nothing. It is legitimate because it’s all we have. And, let’s face it, I know stacks of stuff, I’ve had 45 years of sucking in knowledge and experience. I’d be a psychological wreck if I didn’t have confidence in my view of the world. It is nothing because there are an infinite number of ‘experience cocktails’ that interpret reality. Everyone, from every social reality; royalty, criminals, marginalised, centred, every scenario, sees their world through their complex baggage of personality and experiences. And then there are a near infinite number of places and cultures to be experienced. In the scheme of things I know nothing. About anything. This is not just a size thing. For example, we could argue that in the extraordinary size of the universe where the numbers of zeros become meaningless, the earth we live on is nothing. And it is everything. This is different than what I mean, because we know that the earth is unique in its capacity to cultivate life. So there is an objective specialness about the earth. The metaphor would be true to what I am trying to say if there were millions of earths. From the perspective of those that live on them, their world is everything. In the scheme of things they know virtually nothing about everything there is to know. How do we hold the legitimacy and the relative nothingness of our perspectives together? I think by humility. We can argue strongly for our view. We can ensure our knowledge and experience adds value. We must back ourselves and our judgements when the call is ours to make. But we recognise that wisdom comes not from the cleverness of an argument for a particular perspective but from the ability to account for different ones. We will always hold and offer our views lightly; they are not objective reality, they are our view of reality. This mix of strong conviction and openness to other views is a rare attribute. In my view, it will be a key one for leaders to navigate the complexities of the world in which we now find ourselves.